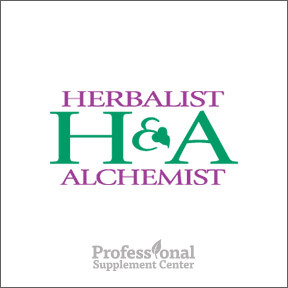 Professional Supplement Center is pleased to announce the addition of Herbalist and Alchemist, a line of quality, safe and effective herbal supplements designed to support health and wellness. H&A was founded in 1982 by David Winston, a clinical herbal practitioner who had a mission to develop and manufacture the highest quality herbal supplements using only organically grown, ethically wild crafted or sustainably harvested plant material. H&A has created an environment of teamwork under which every process is continually monitored. H&A fosters long-term relationships with organic farmers and sustainable wildcrafters through fair and honest business practices to source whole, fresh raw materials locally and worldwide. All extracts are produced on sight under Good Manufacturing Practices guidelines using a trademarked BIO-SPECIFIC™ process. These formulas are developed by herbalists trained in Western, Chinese, Ayurvedic and Cherokee herbal medicine. H&A works in conjunction with Rutgers University New Use Agriculture and Natural Plant Products Department to optimize botanical selection and extraction processes. Identity and third party testing ensure species authentication and that all raw material and finished products are free of heavy metals and pesticides. Adrenal Balance Compound™ – This highly concentrated herbal compound is formulated according to each herbal ingredient’s distinct chemical makeup and is useful for promoting energy and balancing stress. Ashwagandha (ASW) – Long used in Ayurvedic medicine to nourish the blood and rejuvenate the body, this formula, derived from withania somnifera root, aids in balancing endocrine function. Immune Balance Compound™ – This immune balancing formula contains reishi fungus, turmeric rhizome, ashwagandha, licorice root and other herbs in support of overall healthy immune function. Men’s Formula™ – This compound, comprised of ashwagandha root, maca root, panax ginseng and other herbs, is formulated for overall support of the male reproductive system and to support healthy sexual libido and function. Sinus Support compound™ – Formulated with herbals such as echinacea root, eyebright and horseradish root, this formula supports healthy sinus function. Muscle/Joint Tonic™ – This concentrated herbal extract contains sarsaparilla, turmeric and ginger rhizomes along with willow bark and other herbs in support of healthy muscle and joint function. This entry was posted in Home and tagged Adrenal Balance Compound, Ashwagandha (ASW), Herbalist and Alchemist, Immune Balance Compound, Men's Formula, Muscle/Joint Tonic, Sinus Support compound. Bookmark the permalink.